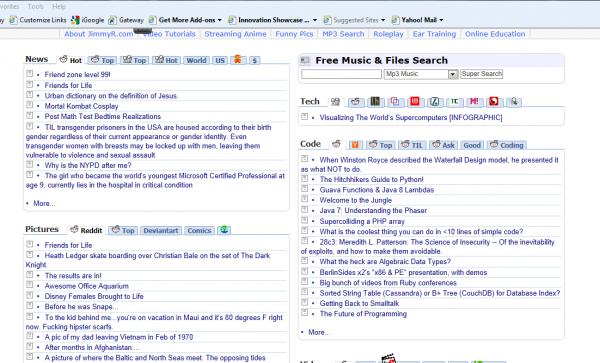 Rather than discuss software or trends, tweak, tricks and tips, this article is about a great site called JimmyR.com. This site is packed from page to page with all sorts of tech news, information, other news, coding tips for programmers and much more. How is this useful to you? 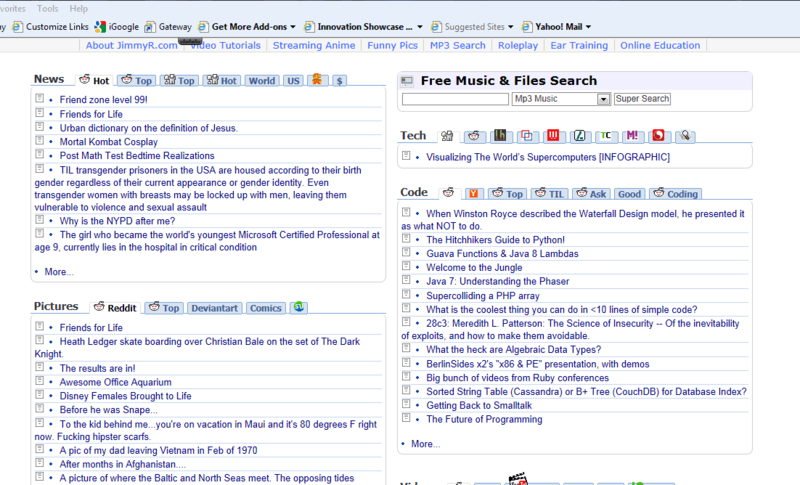 Just go check it out and you will instantly be greeted with a plain, but full page of multi-tabbed lists of topics ranging from silly pictures (the truly funny kind that a geek can understand) and strange news reports to streaming Anime and video tutorials. It even has comic books. Many proud geeks happen to be fans of comic books and Anime, so that is a good touch. You can get lost in this for hours, should you have the spare time. You have programming topics like supercolliding a PHP array, Java coding tips, The Hitchhiker’s Guide to Python and various code topics. The bottom line is that this is a very useful site for anyone tech oriented or interested in tech topics as a beginner, but it has appeal for many others as well. This pulls together a wide audience and shares the most important thing that can be shared: information. As far as the kids are concerned, there are a variety of online education topics and tutorials to help with both basic and complex academic subjects. This is an excellent way for your kids (or if you are a kid) to be introduced to intellectually relevant topics. You can build a fundamental understanding of many technical topics and delve into more important current news topics in addition to news humor. After sweating away a few hours of coding or tinkering with your operating system, you can enjoy some Anime or other fun videos. This is not your average site by any stretch of the imagination and just about any user can find something on JimmyR.com to occupy some brain space for awhile. Should you care to understand certain coding topics more, that is one of the best features. For example, if you are struggling to understand algebraic data types, you can get a nice breakdown of the topic. Fledgling programmers and more inquisitive children can gain much from this. Here you have part of a chart explaining algebraic data types, compliments of the site. It is quite different from the site you are reading this at now. However, every good user likes to browse dozens of sites on a regular basis. For the technically oriented, JimmyR.com will give you plenty of time-consuming reading. This is not a bad thing at all. Finally, the site is not stuffed with ads and it is open to user posts for blogs, pictures and just about anything else relevant to the theme of the site. It is uncertain whether anyone who is not interested in the tech side would find the content interesting. At the very least, the average user can start to become more of a power-user with much of the information here and grow their brains in many other ways. Have fun! Neat. A similar site I like is freshnews.org. Good alternative, thanks for posting. Use to be a great site years ago for MP3’s but he has changed it all around. Totally ruined now. So sad. Wish it would go back to the search layouts.